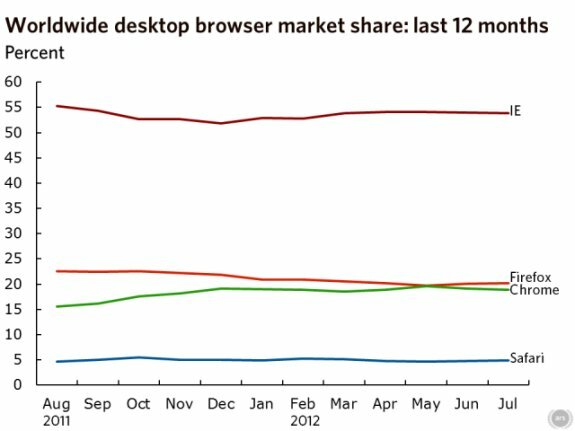 ARS Technica provides an update about the browser market, noting that Firefox is once again gaining ground while Internet Explorer and Chrome are losing marketshare. Full details over here. Internet Explorer stays in gold with a 53.90 percent share of the desktop market, down 0.10 point from June. Firefox is up 0.14 points to 20.2 percent. Chrome picks up the bronze with an 18.9 percent share, down 0.18 points from a month ago. Safari is up 0.17 points to 4.90 percent, and Opera essentially unchanged, down 0.01 points to 1.59 percent. So Chrome just missed out on overtaking Firefox again. In another near miss, Windows XP is still, for another month at least, the most widely used operating system. The last few months have seen Windows 7 make steady ground on its ancient predecessor. In May and June, Windows XP made substantial losses, down 1.23 and 1.24 points, respectively, for a June share of 43.61 percent. In those same months, Windows 7 made large gains, picking up 1.84 and 1.08 points, for a June share of 43.61 percent.